Coors Light is running a localized marketing campaign in British Columbia poking fun at Torontonians. 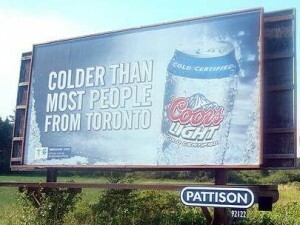 The billboard campaign proudly declares the beer is "Colder Than Most People From Toronto." There's just one problem with Coors Light's current campaign. In this age of smart phones and social networking and blogs and Google, can an ad campaign truly stay local? How many Torontonians are going to see this billboard today? Be careful what you put on that billboard, because it won't just be seen by the local Toronto-haters, and there are a helluva lotta beer drinkers here in the 416. I look at this as a positive. If people see this ad and get upset, they might just stop drinking that garbage and start drinking actual beer. I live in Toronto, and I don't have a problem with this ad, I thought it was pretty funny. This is not a big deal, and it says its colder than "most" people that can mean that they are not cold at all and that the beer is colder. Besides if u were told that you were cold that is also a slang that could be something good. Unfortunatley, the ad is accurate. I saw this today on an elevator at Bankers Hall in the heart of Calgary. Beer drinkers won't be affected by this ad - Coors Light is piss, not beer. See Elvis, YOU'RE who they're referring too. Rather than laugh at the satire, you have to comment on the quality of the beer. It's just typical of Ontario. Toronto has no sense of humour. The rest of the country does. I love that ad man. I had a good laugh on that one today. If I'm up to date with my slang, and it's possible I'm many years behind. Very cute ad; gotta commend them for it. I'm a former Torontonian, so I have first-hand experience with people there...and it's generally a true fact. "This ad is hilarious and genius in its quest!" There is quite an element of truth to it, and it brilliantly pokes fun at Toronto WHILE getting the Toronto-haters endeared to the beer! I know the next time I enter the Beer Store - Coors is the first thing I will think of. (And we all ask for the first thing we think of!) "I am a Torontonian, and I love the ad!" It indicates we on par with other huge metropolitan "cold/mean/bad" cities other hicks are jealous of and "love to hate!" meh. most people who hate toronto have never even visited. I think it's funny. People are talking about it so it's worked. Beer billboards mocking Toronto coming down in B.C. Billboard ads in British Columbia for Coors Light beer are being taken down after complaints from Toronto residents offended by the message. About 30 billboards throughout the province show a can of cold Coors Light and the words: "Colder Than Most People From Toronto." Adam Moffat, Coors Light manager of brand and marketing public relations, said Tuesday the company has received about 10 calls and emails over the billboards, and most of them were complaints. "I've been on the receiving end of a few emails," he said. "Clearly we've struck a chord with Toronto civic pride…. People are saying they're proud Torontonians and feel it's not fair to be treated in this way." "Stuck up more than the people of Toronto"
"Thinner skins than the people of Toronto". Get over yourself people. I lived in Toronto. While, not laugh out loud funny, the ads are amusing. Kinda makes sense that Torontonians are mad.. where do u draw the line? What if Advertisers started to tease Newfoundlanders.. and granola eating, socks and sandals wearing Vancouver residents. Other places are quick to dish out on Toronto, like somewhere there is a licence that says it's ok to diss us. There aren't any billboards in NFL because no one can read out there. Thank you ladies and gentlemen, I'm here all week. But we wish you weren't! "10 calls and emails over the billboards"
And that's all it takes... 10 calls and emails. I find it interesting that Irvine doesn't like a comment from Elvis, someone who he clearly has animosity towards, automatically jumps to the broad stroke statement "Toronto has no sense of humour." Must have huge psychic ability to know how every single person in Toronto thinks regarding a topic. What is with the West's obsession with us Torontonians? 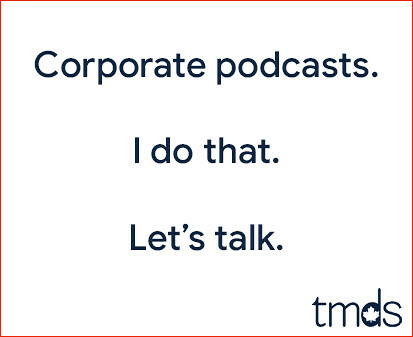 I always thought they spent way too much time thinking about us, but to actually put it in an ad? This alleged east-west rivalry is totally one-sided. Making fun of the beer doesn't necessarily mean we're offended by the ad. The ad was somewhat amusing, but ad or no ad, that stuff is friggin awful. Don't you know that every call/email represents one million people? "Do you see Newf's take offense over Newfie jokes? no. Do you see those from the Peg take offense when you make car theft jokes? No. Do you see Sask types take offense when you say "you can see your dog run away for 2 days". no. Do you see people in Calgary or Edmonton take offense when you poke fun? No. Nor do you see BC types loose it if you call them stoned pot head hippies. They just laugh"
WOW, ya must be magical... how is it that you know if all the people of nfl,cal,sask,b.c etc, etc, have ever took offense to those types of comments? ps: those "jokes" weren't posted on billboards either. If you don't like the ads, go back home! And..Toronto is rotting away. Toronto has a higher unemployment rate than St Johns NFLD, Halifax, hell even Montreal. Many of the head offices "fled" to Mississauga, then later came to Calgary. Toronto, a have not city in a have not province. LOL. The "Centre of the Universe". When I lived in Toronto, it was common to make fun of Americans. So how come it's WRONG for other parts of Canada to pick on Toronto..but it's OK for people in Toronto to make fun of America? Irvine, supporting the "kick Ontario out of confederation" movement. Very funny! Coors Light is good pounding beer. Beats water! Can't drink too much real beer when it's this hot! LOL,"supporting the "kick Ontario out of confederation" movement." Just like a transplant Westerner! That would be great! We could draw the line at Saskatchewan and Alberta. You sell all your dirty oil to the States, (anyway) BC can keep their rain. We'll join with Quebec(many Francophone's live in Ontario) and the East coast(Canada's playground)and see how you yahoos in Alberta fend when the oil runs out or better yet, my Canada gets off oil! Now, Irvine, see how silly that sounds?....... Hmmm.... just might work! Due to complaints, they are pulling the ads. I like the idea of a separate Ontario and am entirely in favour of banning narrow-mindedness like yours by refusing to issue you a travel visa. Now, can't we talk about something a little more important? You started it.......the narrow-mindedness. If that is actually a word! Oh, keep your Visa or passport! I support Canada. Work, play and spend here. I look for MADE IN CANADA! I'm a real pisser about that as should every other TRUE Canadian be. Well, I gotta say it is kinda true. After spending time in some of the other major Canadian cities I can't say that the urban cores of Calgary, Edmonton, Montreal, etc etc, have much warmer and friendlier ppl than Toronto though. After living on the East Coast and in Ontario I've realized the ignorance that a lot of ppl from both provinces have towards the rest of Canada is actually kinda funny. Anyways, Coors is a horrible beer...tastes like typical crappy homebrew and you have to drink 12 of them to get a buzz. Not really surprised at all. When you're part of the cultural elites the mullets will complain. People from lesser cities like Vancouver, Calgary and Edmonton have always begrudged Toronto for being a superior city. Mark, coors doesn't need you. Toronto is a 3rd world city. I just moved into Toronto from another country after 15 years as an expat, although originally born and raised in Vancouver, I am finding people from Toronto very warm people ! Just goes to show how spoiled you Canadians can be. You should have seen the former British colony I was living in ... now that's one cold bunch !!! NIce ad terrible drink not sure its beer ! Good try though trying to sell it as beer. Oh i just got the joke its about Toronto, good one Coors no one drinks your fizz pop, its not beer ad man. If you like beer i mean real beer you have to drink thats made outside of North America. Just cause you sell lots of bottled dish water doesn't make it beer. hhehehe yes we have a sense of humor.. Toronto Doesn't care what u think. Oh Old Toronto south of bloor, suburb toronto upto Steeles, Scary Toronto [Scarborough] Woppy Toronto [Etobicoke] just watch the city will soon chew on Miserysaga and Pickering soon we need more tax dollars to feed city hall. this is such a cool ad, i see nothing wrong in it. to each his own anyway, right? Torontonians who get upset over something like this have no sense of humour.